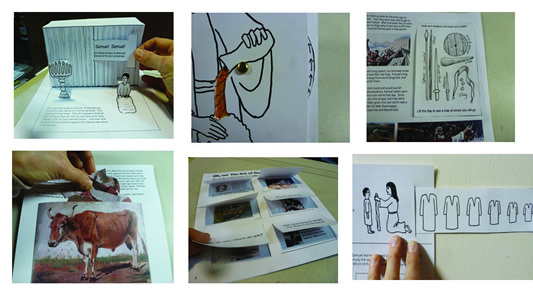 To provide some hands-on art/craft activities for the main stories about the prophet Samuel. This booklet is a do-it-yourself project, where you print the page patterns onto card stock paper, then print out the extra flaps and activities and glue them on. The book is made of 8 pages (cover plus 7 pages front and back). You can staple the pages together, comb bind them, or punch and stitch them. The activities include pop-up pictures, lift-the-flaps, pull-out pictures, a maze, a puzzle, some drawing and writing, a rotating wheel, and more. Doing it once a week (such as for a weekly church class), it will take you about 3 months to complete if you do just one page per week. (There are 13 pages of activities.) If you work on it daily at home, then more like two weeks. It also depends how long you stay on each story and if you supplement with additional activities. NOTE: Some of the copies are in color. I assume that most people have color printers, either laser or ink jet, with their computers nowadays. If you don’t have color, you can either have them printed at a copy shop, ask a friend to print them for you, or just print them in black and white. Sorry for any inconvenience.